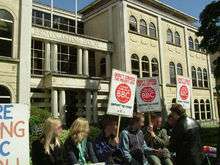 Picketing is a form of protest in which people (called picketers) congregate outside a place of work or location where an event is taking place. Often, this is done in an attempt to dissuade others from going in ("crossing the picket line"), but it can also be done to draw public attention to a cause. Picketers normally endeavor to be non-violent. It can have a number of aims, but is generally to put pressure on the party targeted to meet particular demands and/or cease operations. This pressure is achieved by harming the business through loss of customers and negative publicity, or by discouraging or preventing workers and/or customers from entering the site and thereby preventing the business from operating normally. Secondary picketing people picketing locations that directly connected to the issue of protest. That would include component suppliers on which the picketed business relies, retail stores that sell products by the company against which is being picketed, and the private homes of the company's management. In many jurisdictions, secondary pickets do not have the same civil law protection as primary pickets. Another tactic is to organise highly-mobile pickets, who can turn up at any of a company's locations on short notice. The flying pickets are particularly effective against multifacility businesses that could otherwise pursue legal prior restraint and shift operations among facilities if the location of the picket were known with certainty ahead of time. The first recorded use of flying pickets was during the 1969 miners' strike in Britain. Increasingly, with the introduction of the Internet and digital photography, picketers have placed cameras at the entrances of their targets, often accompanied with written notices warning those who cross the picket line that their photographs (and, where known, their names and addresses) will be posted on the picketers' website. Their legality has been challenged in some jurisdictions on the grounds that such tactics violate privacy rights and/or are intended to incite later reprisals against such individuals. Historically, picketing was banned by a Liberal government in the Criminal Law Amendment Act 1871 but then decriminalised by a Conservative government with the Conspiracy and Protection of Property Act 1875. ↑ "Picketer | Define Picketer at Dictionary.com". Dictionary.reference.com. Retrieved 2010-09-01. ↑ Beckett, Andy (2009). When the Lights Went Out: Britain in the Seventies. London: Faber & Faber. p. 70. ISBN 9780571252268. ↑ Strike: 358 Days that Shook the Nation. London: Sunday Times. p. 264. ISBN 0-340-38445-X. ↑ 52 Geo. L. J. 248 (1963-1964)Federal Regulation of Recognition Picketing ; Shawe, Earle K.
↑ ""Stale" Contract No Bar to Recognitional Picketing". Labor Law Journal. 17 (6): 384 1/2p. June 1066. ↑ "Timeline:1850–1880". TUC history online, Professor Mary Davis, Centre for Trade Union Studies, London Metropolitan University. ↑ "PICKETING". The Columbia Electronic Encyclopedia. Columbia University Press. "Picketing". Encyclopædia Britannica (11th ed.). 1911.